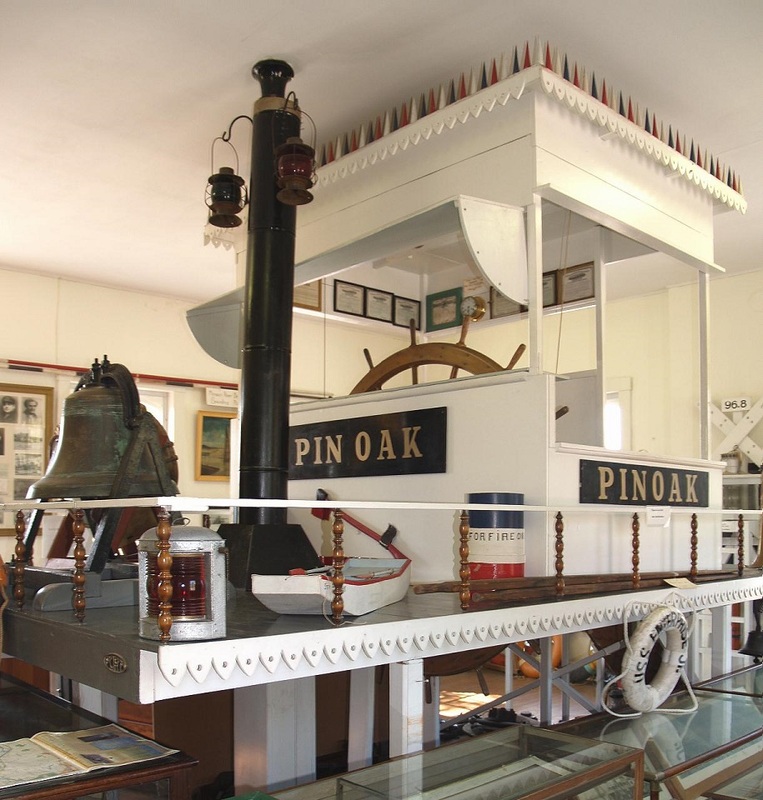 Here is my photo of the Hermann museum with quaint mock up of PIN OAK's pilot house. 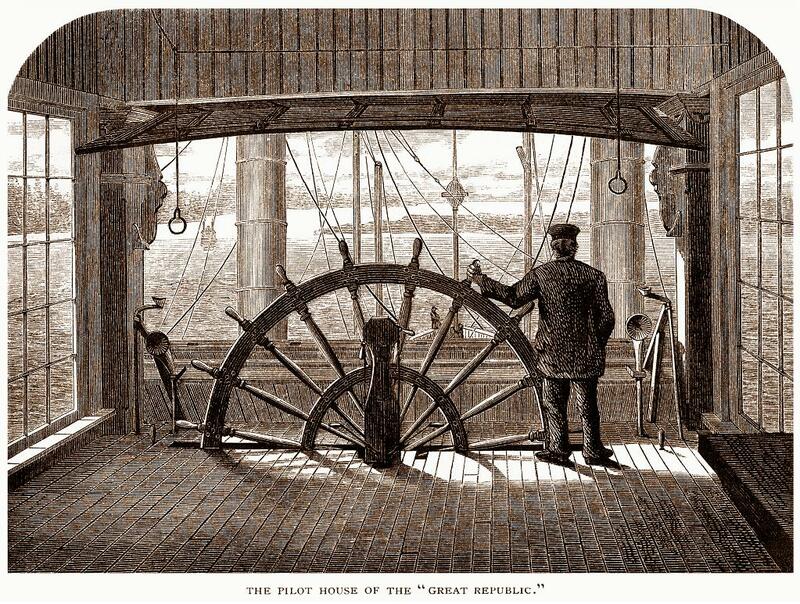 Here's the October 1874 Scribner's Monthly pilot house of the Great Republic which as I mentioned we have in a smaller, less glorious incarnation in 16th place on Illustration1 in the museum of nautical steam-driven wonders. 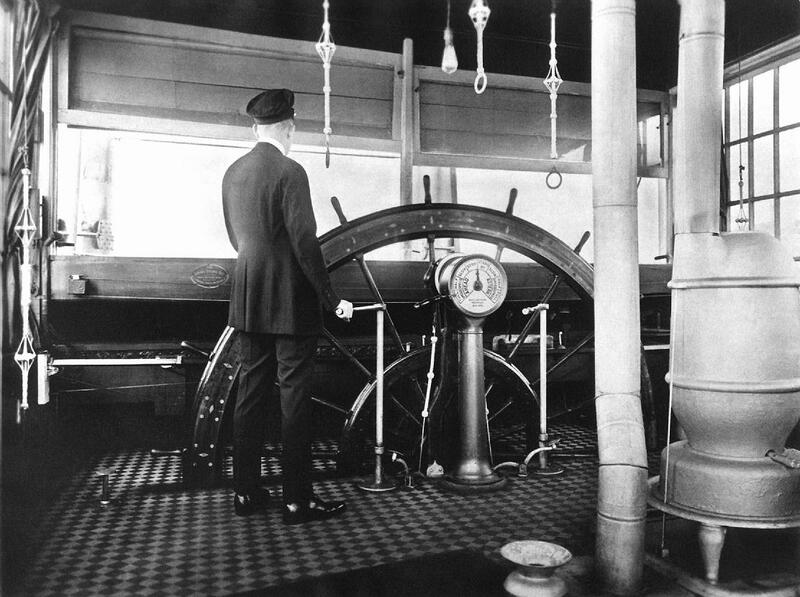 Pilot house interior of the snagboat Horatio G. Wright featuring huge and impressive pilot wheel, what a Jim Dandy! The Wright was built 1880 at Carondolet, MO by Western Iron Boat Co. for the U.S. Engineers. It was dismantled in 1941. The man at the wheel is unidentified. 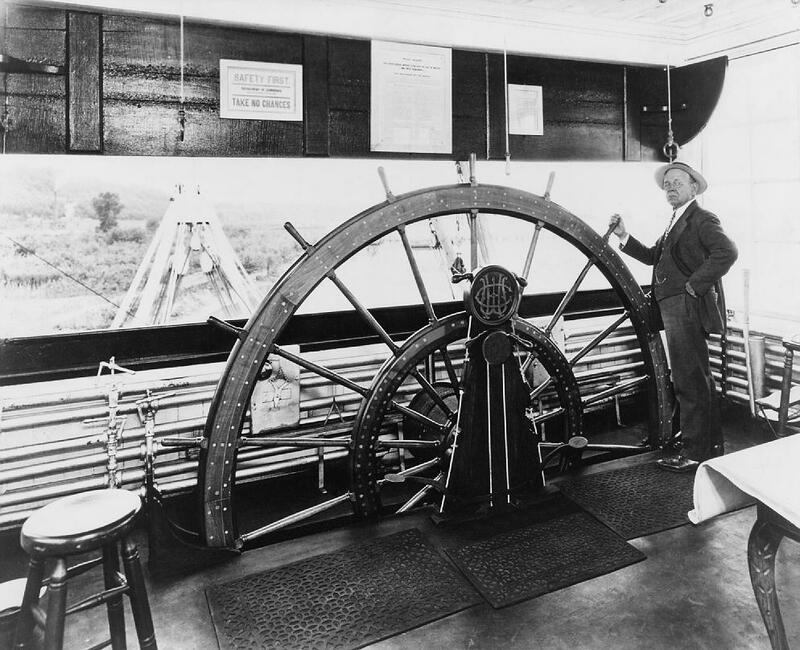 Horace Bixby spent the last years of his long career on the river as a pilot at the wheel of the Horatio G. Wright. Bixby was the pilot who "learned the river" to young Sam Clemens from 1857 until 1859 when Sam was awarded his Pilot's License. This is from Keith Norrington's collection. As you know Keith is now Director and Curator at the Howard Steamboat Museum in Jeffersonville, Indiana. Behold! Pilot Harry English in the pilot house of the QUEEN CITY in 1918. Aboard the U.S. Mississippi River Commission Inspection boat MISSISSIPPI. Pilot L.H. 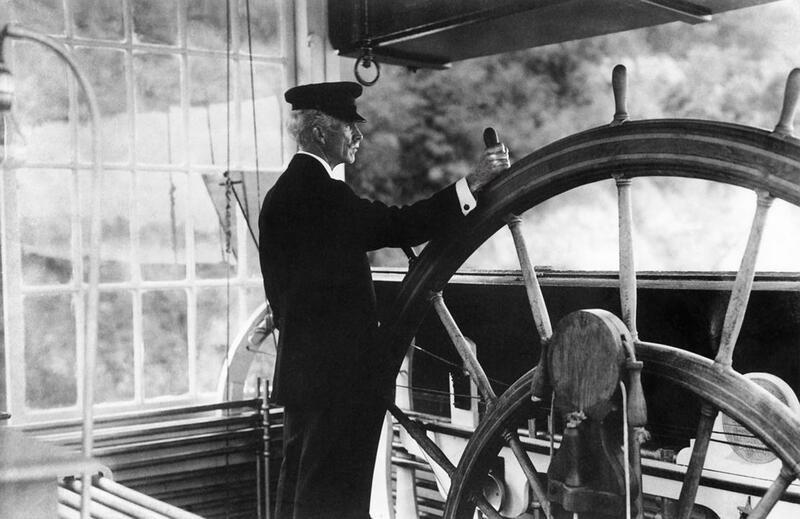 Sanders at the wheel in 1907 during the voyage of President Teddy Roosevelt. Favorite iconic pilot house interior! 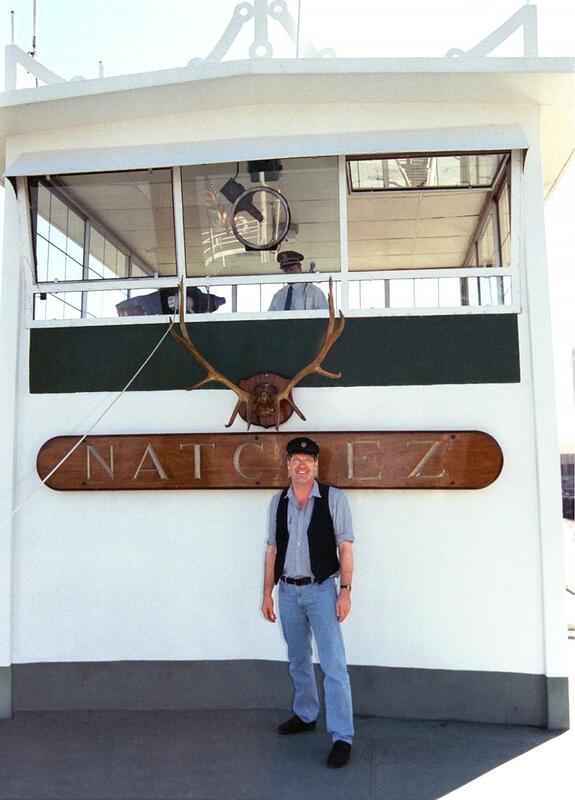 NATCHEZ at N'awlins 1989 . . . Verne Streckfus is in the pilot house. October 1989 is when Doc Hawley gave my brother Darryl and I the "behind the scenes" tour where tourists usually didn't go. 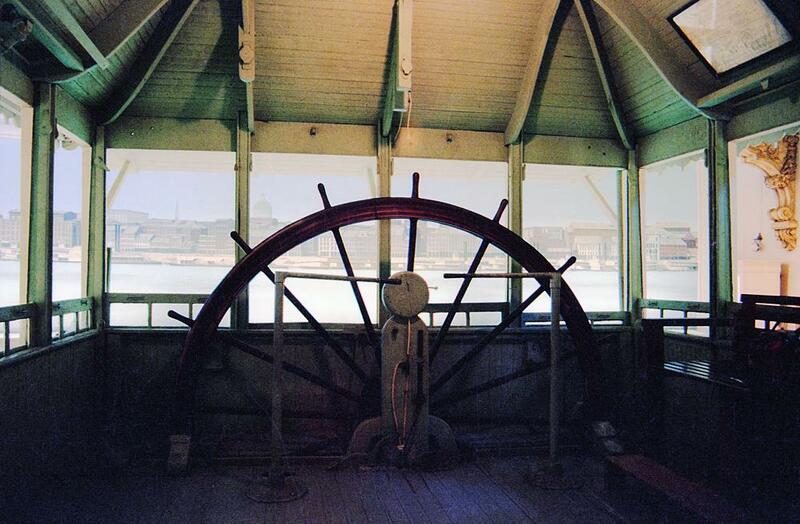 Attached my favorite photo of the pilot wheel from Fred Way's beloved BETSY ANN displayed in an alcove made of windows through which the Mississippi River can be seen. Some of the Golden Eagle River museum's collection of log books are now in the St. Louis Mercantile library. Among them are the logs of the steamers BETSY ANN, DUBUQUE, GOLDEN EAGLE. They also have the ledger from Cap'n Buck Leyhe's Eagle Boat Store. Detail from the Betsy Ann pilot house. 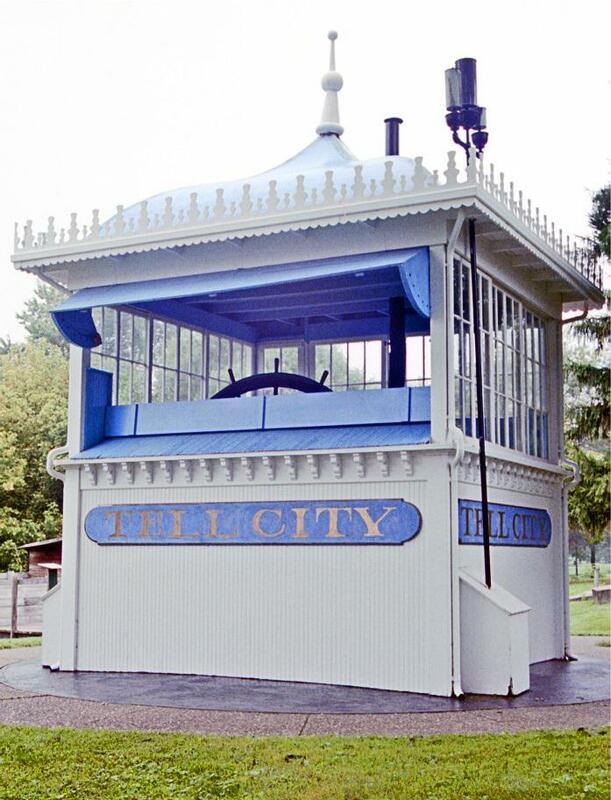 TELL CITY's pilot house restored and preserved on the grounds of the Ohio River Museum in Marietta, Ohio. Original price, $21,350. Home port or owner's residence circa 1889, Louisville, Kentucky. She originally had double stages; changed to a single stage in November 1898. She worked in the Louisville-Evansville trade and after 1895 was teamed up with the TARASCON. In 1911 she was rebuilt and widened at Point Pleasant, West Virginia. In September 1898 she sank in the Louisville-Portland canal and was pumped out by the towboat TRANSIT. In 1916, after going under the ownership of Captain Hornbrook and others, she worked in the Pittsburgh-Charleston trade teamed up with the R. DUNBAR in the Ohio and Kanawha River Transportation Company. She replaced the KANAWHA which had overturned below Lock #19. On April 6, 1917 the TELL CITY was down bound and had landed at Little Hocking, Ohio. Pilot Mike Davis ran into problems leaving the landing and was forced into shore just below the landing on the Ohio side, and hit with enough headway to knock down her stacks. She sank rapidly. Her pilot house was saved and used as a summerhouse in the yard of a couple at Little Hocking, Ohio. Later the pilot house was moved to the grounds of the Ohio River Museum in Marietta, Ohio. 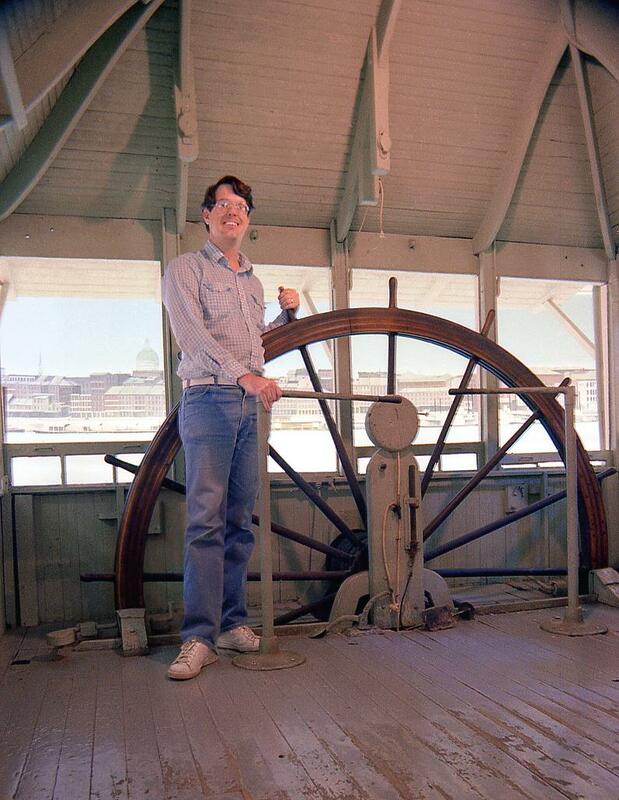 Dave Thomson in the pilot house of the GOLDEN EAGLE in the early 80s as it looked when it was still on display in the Missouri Historical Society's museum in St. Louis. 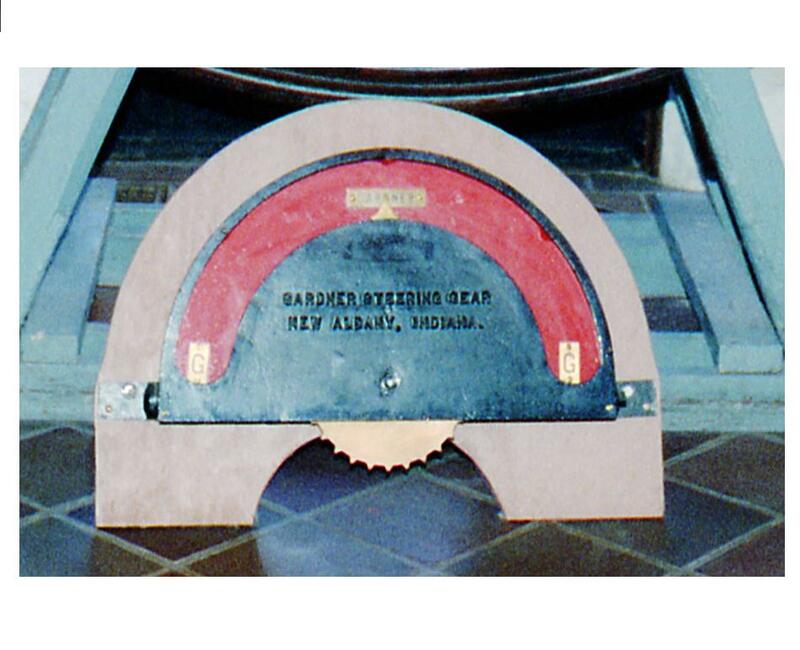 The pilot wheel is the only thing from this exhibit which can be seen there now. Hope someday the dismantled pilot house will be taken out of storage so it can be enjoyed in all its glory again. Attached scan from neg I took at the Missouri Historical Society of the GOLDEN EAGLE's pilot house with a mural of the St. Louis waterfront "outside." 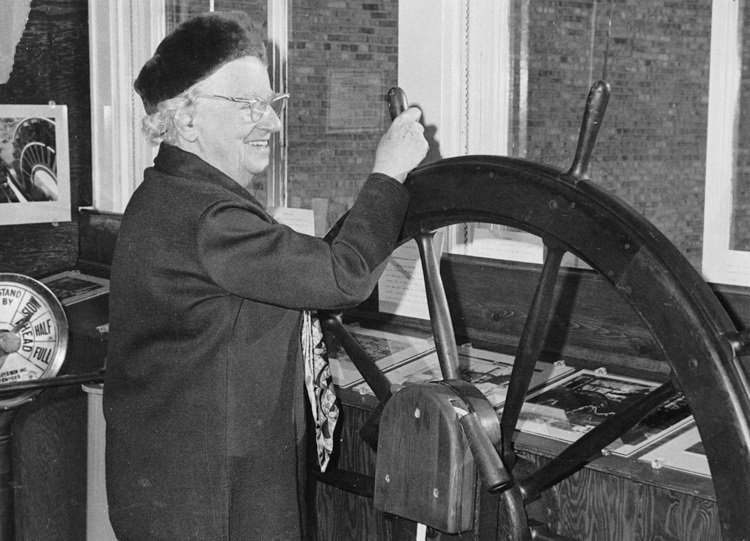 Here's a Murphy Library photo of the GOLDEN EAGLE's "Daddy," Captain Buck Leyhe at the wheel in the same pilot house. It appears that the photo was taken at dusk, what little sky that's visible is pretty dark. My favorite Murphy photo of the GOLDEN EAGLE was taken at a wharf someplace. The seated me in the lower right may have been crewmen waiting for their pay checks. The gent in the light hat and suit standing on the front of the stage looks like he could have been payroll master. The fellow with the maritime cap could have been an officer from the EAGLE. Originally the WM. GARIG (built 1904) was sold to the Eagle Packet Co. in 1918 and was renamed GOLDEN EAGLE when she was built in 1904. 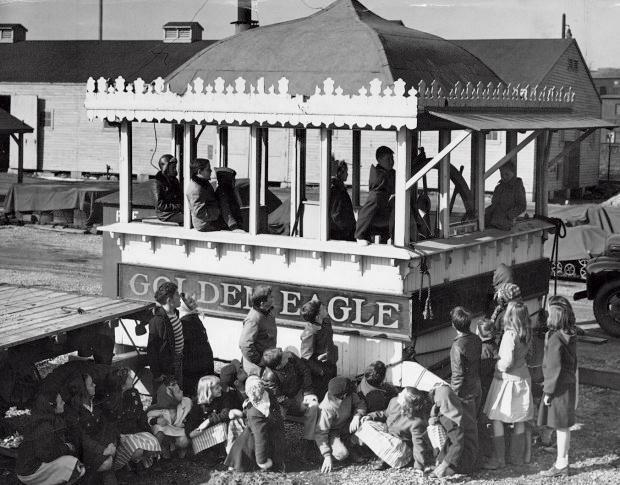 In May 1947 the EAGLE sank at Tower Island and passengers and crew were all evacuated safely. 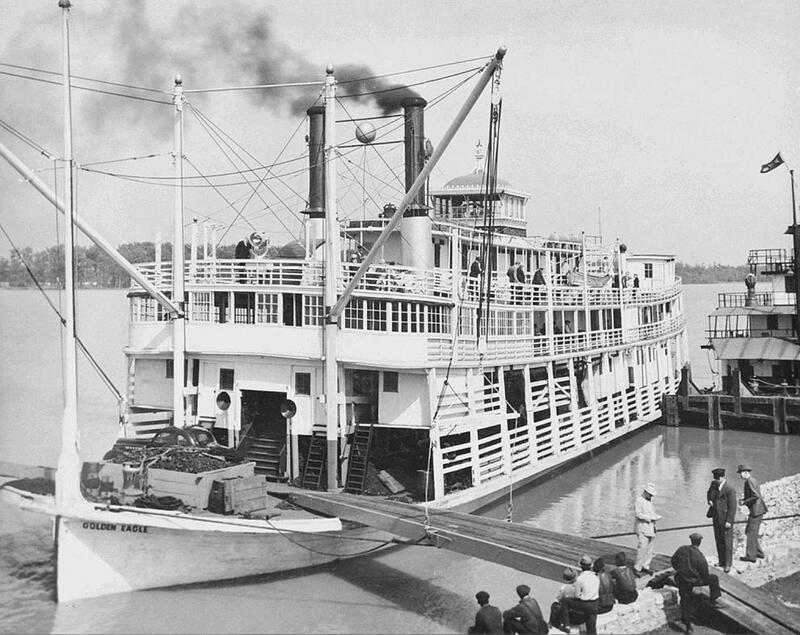 She had the distinction of being the last wooden hulled passenger steamboat to ply the Mississippi and tributaries. 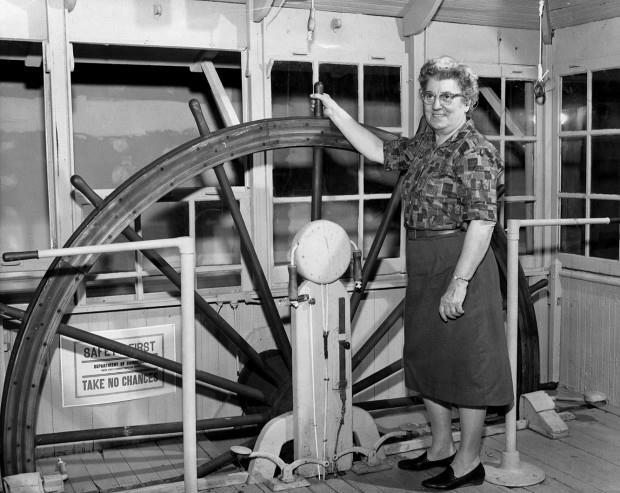 School teacher Ruth Ferris of St. Louis introduced one of her young students, John Hartford to steamboats and he always celebrated her for saving the pilot house of the Golden Eagle's pilot house and getting it moved to the grounds of Community School in St. Louis County where she taught him an many other students. The following letter to the editor that Miss Ferris wrote in January of 1955 was published in the Waterways Journal in February '55. Miss Ferris mentions a photo of the pilot house that she sent to be published with her letter but instead I have attached an interesting photo of the pilot house on the Community School campus, surrounded and occupied by her students. They performed plays that she wrote for them where they portrayed Captains, pilots, engineers and crew members. 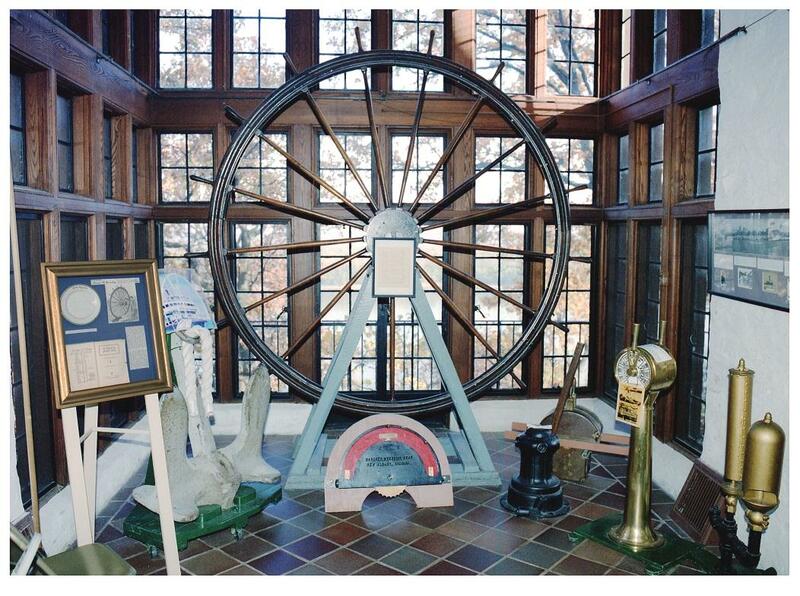 The pilot house was later exhibited at the Missouri Historical Society but today only the pilot wheel is on display and the rest of the pilot house was dismantled and resides in pieces in storage with no plans to reassemble it and exhibit it in its entirety again. To the Editor of The Waterways Journal: I hope you will have space to print a recent picture of the pilothouse of the steamer Golden Eagle so that Capt. W H. Leyhe, and all Waterways Journal readers who loved the Golden Eagle, may see what shape it is in. It rests on a concrete block foundation and is as structurally sound as any 50-year-old pilot house could be. We are aware that it needs painting. Before Christmas bids were taken and after action by the Finance Committee of the Community School Association the contract will be let. This job will include scraping and two coats of paint. All three name boards will be lettered by a professional sign painter. The pilot house is a special and treasured feature of the beautiful 16 acre campus of the Community School at 900 Lay Road, St. Louis County. We regard it as an educational exhibit to be used in the teaching of history and as an historic relic of special local interest. It is the intention of the school to maintain it in good condition for these purposes and in keeping with the rest of the school buildings. The Community School, founded in 1914, is a private coeducational elementary school. 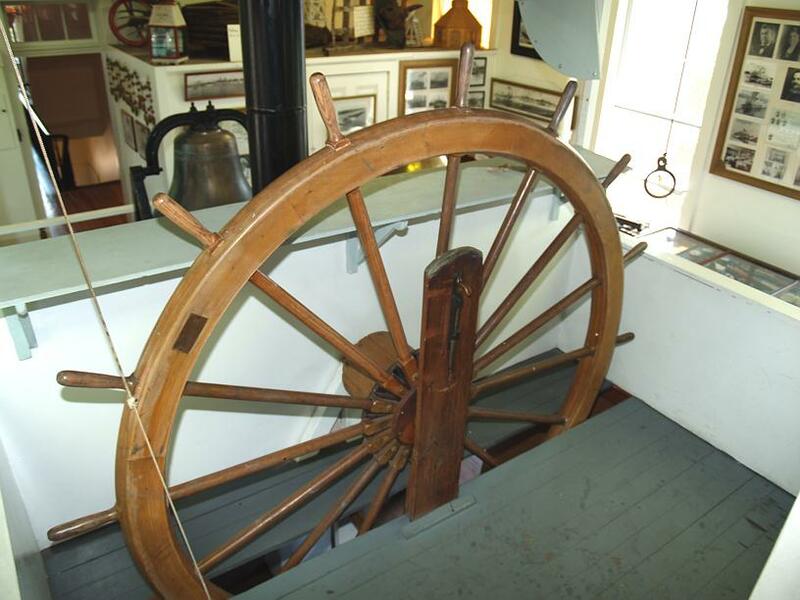 We will be happy to have anyone interested in steamboats and river lore to visit the pilot house at any time. "Her salvaged treasure yet shall keep Her glory fresh in mind." Fifth Grade teacher and Assistant Principal. EDITOR'S NOTE : Miss Ferris was prompted to write the foregoing letter, and send the photograph, after reading a statement by John Harford of St. Louis in the January 22 Waterways Journal—"that the pilothouse of the steamer Golden Eagle, after eight years of sitting on the Community School grounds, is in a pretty sad state of affairs." She loved the river, and she taught about it too. With her great big collection of steamboat stuff. Oh, yeah! And she knew the old captains and where they were at. As the Cape Giraudeau, she was later renamed, Uh-huh. Was the Golden Eagle, Captain Buck's old boat. When I was in the fourth grade, in nineteen forty-seven, Uh-huh! They didn't think the boat would sink. Oh, no! But immediately, her mind went to work. Oh, yeah! Dreaming about boats and the Mississippi River. Uh-huh. Oh, she was a dead shot with a little piece of chalk. Uh-huh! Oh me, oh my, how the time does fly. Time and the river keep a-rollin' on by. But, we both still love the Mississippi River. Uh, huh. Well, I went to see her this Christmas last. We took a little trip back through the past. And we dreamed our dreams of the Mississippi River. Uh-huh!